With the culinary explosion expanding, we can get just about anything just about everywhere and I think that's a great change from how I grew up. I first moved to northern New England from Maryland in 1981. I grew up on iced tea with a little sugar and lemon. I don't remember now whether I led or followed iced tea here, but shortly before that you could not get iced tea here. The concept just didn't exist. However, you could get iced coffee. Growing up, my grandfather was the only person I knew in Maryland who drank iced coffee. I make them both all summer long, but times have changed. Then there is sweet tea down south and Long Island iced tea that contains no tea at all (I am told). It got me to thinking about the regional foods that are now becoming more available, but not long ago you simply could not find if you weren't in the right place. Cornish pasties. Anyone know of a source in or near Seattle? Rye bread baked on blood is getting harder and harder to find even in it's heartlands. Though I seriously doubt it would be possible to sustain any kind of civilisation in a cold climate without blood bread. Rich in protein and slow carbohydrates it keeps you going when few other foodstuffs would do. Traditionally huge bundles of dried blood bread packed in straw were brought as provision by seal hunters who lived in an unheated canvas tent inside an open boat on the ice far out to sea for months on end. Cooking a sort of soup from blood bread and seal meat in a kettle over a woodfire on the ice when the weather was good and while the firewood lasted and else eating their blood bread as it was. The Finnish trans Greenland expedition was also largely blood bread powered. I like it deep fried but some prefer it baked. The last I had baked was dry though. Most restaurants outside of Peru and Ecuador don't serve it but they are easy to raise at home and then of course you can control their diet. Non GMO, no gluten, no animal by products and so on. They like grass clippings, just don't use chemicals on the lawn. Easy to raise, they can be kept outside in a rabbit hutch or if you are an apartment dweller even in a large box under your bed. If you have children don't name them, it can be a problem at butchering time. The pigs that is, not the children. A nice fat one will easily feed 2 adults. If you do it up in a stir fry it will serve 4 or more. Here are some easy recipes. Huh. I grew up on iced tea & ice coffee. There was always a big thermos of ice tea on my folks' boat in the 60's. I go to Montreal to get good smoked and/or dried meat* & especially pate. While you can get a type or two of pate here, it's crazy expensive & not that great. The Atwater market in Montreal has a pate vendor that probably has 50+ kinds. * I don't mean barbecue, but meat that's been smoked like bacon. I love creamed chipped beef & Montreal is the nearest place for true dried beef. At a farmers market near where I live there is a stall that sells Cornish Pasties, the best I've tasted which is a bit ironic, as the worst one I ever ate was in Cornwall. Interestingly, on the OP subject. New Zealand was, back in the 60s and 70s about the most boring place on earth for eating out, but over the past few decades we've had wave after wave of migration from about every place you can imagine, so we've now restaurants specialising in foods from those places.There is a German bakery/restaurant just down the road from here, Mexican and Thai, Indian, Vietnamese, Chinese, Greek, Italian, the list goes on and on. Its very much a change for the better in our much more diverse society. Huh. I wonder if it's a New Hampshire thing? I love creamed chipped beef & Montreal is the nearest place for true dried beef. We still can't get chipped beef here (Esskay dried, salted beef sliced thin as paper). I get it in Maryland when I visit and bring it back, or order it on line. I can't think of a food that has ever unavailable. There is one food, though, that I had never heard of until the last few years: the Acai fruit. Dedicated, " Acai Stores" are now opening. I often went to high tea and goodies, ice tea in the summer, hot tea in the winter at an elderly couples home. Open to anyone that showed up. Participants were usually generational though. Old school folks descended from the original purchaser of the land that became Cooperstown, NY.William Cooper! I moved to VT in 74 & they had ice tea here - but only in restaurants. Always unsweetened though & mixing sugar into cold tea is an exercise in futility. Haven't had Esskay - but local markets here in VT that sold fresh meats always had a big hunk of dried beef you could get sliced thin. Last place I knew of that had it was a market in Montpelier that closed 15 years ago. Now that I think of it, Dakin Farms in Ferrisburg has it - but it's vacuum packed & crazy expensive (IIRC $4.95/oz.). The vendor at Atwater has 3 different kinds, but the folks behind the counter roll their eyes when I ask for a half kilo. That's a lot of slicing! Costs about $10 Canadian for that 1.1 pounds & it's really good. A real high tea is a wonderful thing! In the USA - Haggis ? Wife never goes anywhere without an iced tea in her hand, summer and winter. Around muskrat is a regional delicacy, but Iwill pass. Recipe? She just brews a black tea and pours it over ice. She uses a variety of black teas, sometimes flavored, blackberry, mango, peach, etc. She likes it very weak, never any sugar or lemon. I've eaten muskrat as well but that was of course wild muskrat. Too gamey tasting for me. Domesticated muskrat is not available here. Maybe no where, I've never shopped for them since pork is generally quite inexpensive. I'd hate to try to raise a muskrat in a box under my bed! At most wild game feeds they drown muskrat in barbeque sauce to make it edible. [Muskrat are hard to drown, believe me!] Kind of like they do with skunk and weasel. If it can''t stand on its own flavor without sauce I don't care for it. In the UP, [Upper Peninsula of Michigan] muskrat and and beaver are approved by the church for Catholics to eat during lent because they are aquatic beings as fish are. Beaver and muskrat are aquatic that is, not Catholics. I don't brew iced tea - I cold brew it. I get 2 big tea bags, put them in an old orange juice bottle filled with cold water, and an hour later I pull the bags and put it in the frig. Makes a good jar of iced tea without wasting all that energy. And people wonder why some of us have trouble taking religion seriously? It's like the prohibition against pork. Pigs, if given enough room, are the cleanest of animals raised for meat. Certainly cleaner than sheep! Pho. I first tried it in Seattle in 2002, loved it. Went back east, couldn't find it even at Vietnamese restaurants. Now I hear it's everywhere. When I first came to the US, Budweiser was the beer of choice, there were other similar factory produced lagers. That has really changed in the past 20 years or so. My local supermarket has an outstanding selection of really nice beers. 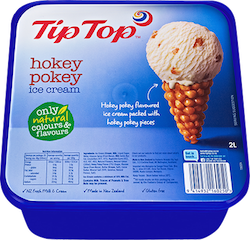 Hokey-Pokey ice cream, which I've seen only in New Zealand. I'm also keen on the green-lipped mussels, which are hard to find in the 'States. Don't go all vegemite on me, just don't. 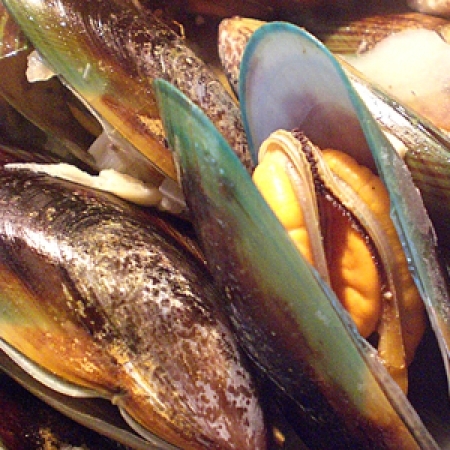 Green-lipped mussels are easy to come by here, but they are usually frozen. A good gyro with sweet sauce, otherwise known as Halifax sauce, is now hard to find. There was a great little hole-in-the-wall place to get one, but after decades in business they've closed down. Not sure we can get soft shell crab in Seattle, not sure we want to. ^Crabs shed their shell as they grow Soft shells are just crabs that have shed just their shell. You have to catch them quick after they have shed...for after just a little while they become, "sheds," with tough leathery ( but not yet hard) shell. If you look around docks and bulkheads or eelgrass you'll see one crab on top of the other. That's one crab with his old shell in front during molt... and the one you want to scoop with your net if you want one of those sandwiches Steven wrote about. Last edited by Breakaway; 04-14-2019 at 06:35 PM. My mother knew how to cook scrapple, so it was crusty on the outside and soft in the middle. Damned if I can figure out how, it always comes apart when I flip it, and all the scrapple that gets to my markets has way more rosemary than the scrapple of my childhood did. I suppose I gotta go back to Philly. Also real bagels. Used to be able to get real bagels in Coolidge Corner (Boston). That bakery is long gone and those bready things everyone sells and calls bagels, decorated with all kinds of miserable crap no self-respecting bagel would bother with, have no clue. Also real San Francisco sourdough is almost impossible. There is a good bakery in West Concord, and used to be one in Oak Bluffs. Lately every time I go to the Vineyard I'm in Vineyard Haven without time to take the bus to Oak Bluffs. The last time I was in West Concord it was 35˚ and there was 6" of the most miserable slushy snow known to man or woman. Oh yes, Cheshire cheese. When I was in West Kirby one year I went into a Tescos and there were three different ages of Cheshire, and both yellow and white. Like we have Cabot Cheddar here. 3-year Cheshire cheese is to die for. I can get 1-year here only around Christmas and it's yellow - ugh. Cheese is only yellow when it's colored with annatto or something worse. And Tillamook 3-year white cheddar is unheard of here in New England. So much better than Cabot "seriously sharp" which barely can be tasted when you make macaroni and cheese. Get the Cabot Hunter's cheese - it's truly sharp. Wow! I haven't had scrapple in so long that I'd forgotten all about it. I need to get some. Thanks for reminding me. Last good scrapple I had was when I butchered my own pigs & saved all the cracklins for it. Trick to cooking it is to cook fairly hot so the outside gets crunchy - definitely hotter than pancakes or the like. Haven't had Esskay - but local markets here in VT that sold fresh meats always had a big hunk of dried beef you could get sliced thin. Take a brick or two of cream cheese and let it soften. Add a jar of ground horseradish (at least 1 jar for 2 bricks and I like more) then at least 3 oz of chipped beef cut into small pieces (remember, what I use is paper thin, "dried", and salty). Mix it all up. Put it in a bowl (line with plastic wrap if you want to pull it later and serve as a ball) and put it in the frig. Spread it on crackers. If you like horseradish like I do, use more. It isn't right if your ears don't tingle when you eat it. Delicious by all reports, but it's one of the few wild meats from around here that I haven't tried.